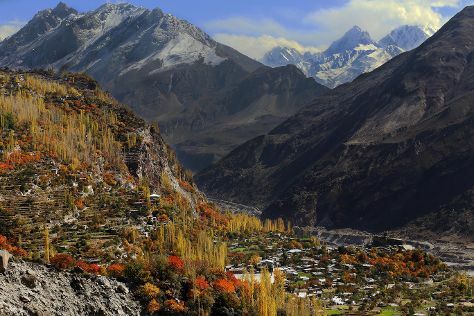 Start off your visit on the 26th (Fri): step into the grandiose world of Baltit Fort, then appreciate the views at Hunza Valley, and then appreciate the views at Hunza Valley. For photos, traveler tips, reviews, and tourist information, read Karimabad online itinerary planner . Lahore to Karimabad is an approximately 10-hour combination of flight and car. You can also do a combination of flight and taxi. Cap off your sightseeing on the 26th (Fri) early enough to go by car to Skardu. Kick off your visit on the 27th (Sat): explore the striking landscape of Deosai National Park. To find more things to do, photos, maps, and more tourist information, read our Skardu online trip itinerary builder . Traveling by car from Karimabad to Skardu takes 6.5 hours. Finish your sightseeing early on the 27th (Sat) so you can travel to Lahore. Lahore is known for historic sites, museums, shopping, parks, and zoos & aquariums. Your plan includes some of its best attractions: steep yourself in history at Badshahi Mosque, see the interesting displays at Lahore Museum, don't miss a visit to Masjid Wazir Khan, and get outside with Bagh-e-Jinnah. To find reviews, ratings, and more tourist information, you can read our Lahore trip planning app . Fly from Skardu to Lahore in 4 hours. In April in Lahore, expect temperatures between 40°C during the day and 24°C at night. Wrap up your sightseeing on the 30th (Tue) to allow time to travel back home.